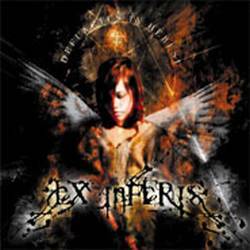 It took Luxemburg's foremost death metal band Ex-Inferis four years to finally release their second non-split CD Defunctus In Heresi which also happens to be their first full-length CD. Reasons for the long waiting period were several line-up changes and the search for a rehearsing room. The overly long intro isn't that great, but everything changes as soon as the second song Blood Soaked Apostasy kicks in. The album was recorded in Lokeren, Belgium and is sounding absolutely professional. That alone wouldn't be enough to make Defunctus In Heresi a milestone in Luxemburgish music history. The most impressing fact is the high speed factor and the technical subtleties of the different songs, especially the double bass in sounding overwhelming. The vocals are very aggressive, sometimes even venturing into black metal regions. Listening to the whole album shows how much Ex-Inferis have developed. The album contains a couple of short songs that immediately come to the point. Other tracks are more classic death metal, while Embers Of Eight stands out with its weird complexity. Stabbed By The Cross stands out as the "hit single", having been featured on several compilations and downloadable on the band's website. Ex-Inferis show their mellower side with a short instumental piece they recorded together with with members of the synth pop band Moussevingt. Of Innocence And Vultures is also quieter and contains female spoken words. Ex-Inferis have always been one of Luxemburg's better metal acts, but their new CD really catapults them to the top.